Shall we consider this the official campaign kickoff? 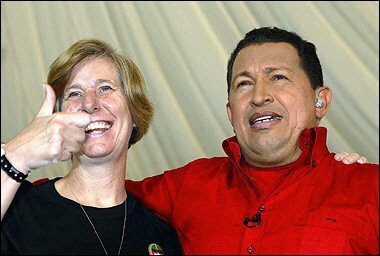 Venezuela's left-wing president, Hugo Chavez, joined U.S. anti-war activist Cindy Sheehan on Sunday to assail President George W. Bush and promised to back her protest against the Iraq war. "Cindy, we are with you in your fight ... she told me that in Easter she's going put up her tent again in front of the ranch of Mr. Danger." Whatever it takes to keep her in the news. Cindy, TSW is with you too! And who says Hugo and I can't agree on something? "I am convinced with your support ... and the support of people all over the world, the war in Iraq will end, our troops will come home, Bush will be impeached and he will be brought to justice," Sheehan said. I have to wonder if this is a plot to make Diane Feinstein look like a centrist. Go vote for Cindy now! We have to make this happen.